Search by Title, Author, Etc. From the beloved author of Because of Mr. Terupt and its sequels comes The Perfect Score, a new middle-grade school story with a very special cast of unforgettable characters who discover that getting the perfect score—both on the test and in life—is perhaps not so perfect after all. No one likes or wants to take the statewide assessment tests. Not the students in Mrs. Woods’s sixth-grade class. Not even Mrs. Woods. It’s not as if the kids don’t already have things to worry about. . . . Under pressure to be the top gymnast her mother expects her to be, RANDI starts to wonder what her destiny truly holds. Football-crazy GAVIN has always struggled with reading and feels as dumb as his high school–dropout father. TREVOR acts tough and mean, but as much as he hates school, he hates being home even more. SCOTT’s got a big brain and an even bigger heart, especially when it comes to his grandfather, but his good intentions always backfire in spectacular ways. NATALIE, know-it-all and aspiring lawyer, loves to follow the rules—only this year, she’s about to break them all. 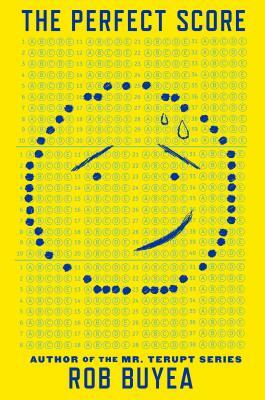 The whole school is in a frenzy with test time approaching—kids, teachers, the administration. Everyone is anxious. When one of the kids has a big idea for acing the tests, they’re all in. But things get ugly before they get better, and in the end, the real meaning of the perfect score surprises them all. ROB BUYEA taught third and fourth graders for six years; then he taught high school biology and coached wrestling for seven years. Currently, he is a full-time writer and lives in Massachusetts with his wife and daughters. His first novel, Because of Mr. Terupt, was selected as an E. B. White Read Aloud Honor Book and a Cybils Honor Book. It has also won seven state awards and was named to numerous state reading lists. Mr. Terupt Falls Again and Saving Mr. Terupt are companion novels to Because of Mr. Terupt. Visit him online at robbuyea.com and on Facebook, and follow @RobBuyea on Twitter.